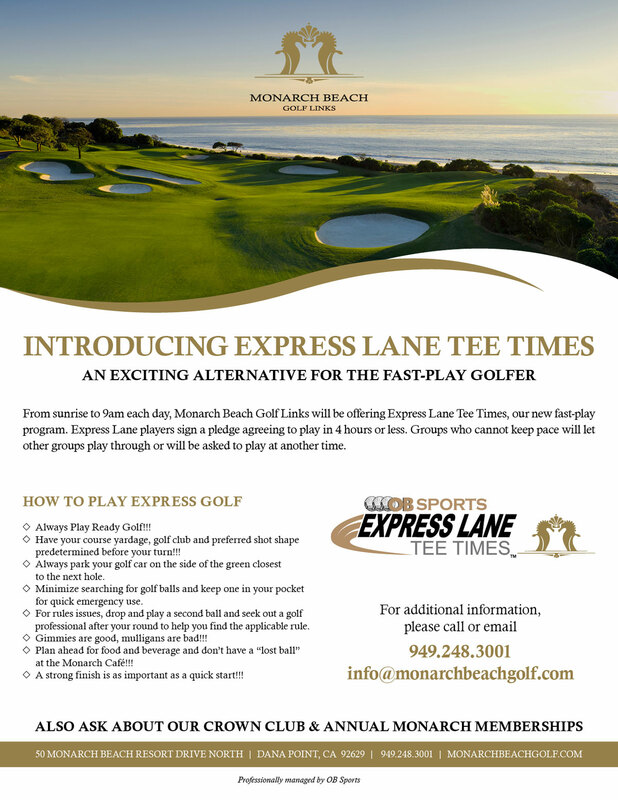 We at Monarch Beach Golf Links understand that your time is valuable. That is why we have a strict Pace of Play policy. Golfers who tee it up prior to 10:00 am are required to golf in 4 hours and 15 minutes or less. If you do not think you can play in 4 hours and 15 minutes or less please choose a tee time after 10:00am. Golfers who tee it up after 10:00 am are asked to golf in 4 hours and 30 minutes. By keeping up with the group infront of you, bringing multiple clubs to your golf ball, utilizing our GPS, putting with the flag stick in & playing double bogie max, you can help us keep pace within this time window. This will lead to a more enjoyable experience for you and other golfers. Monarch Beach Golf Links is proud to offer an exemplary Caddie & Forecaddie Program called the Waterman Caddie Program to enhance your golf experience. Think of a Waterman Cddie as your personal Golf Concierge! Our Waterman Caddies will be along your side or your group for the entire round and will explain the features of the course, suggestions on where to aim/which club to use, provide yardages and much more. Each Waterman Caddie has received intensive training along with knowledge of the nuances of our beautifully crafted oceanfront golf course.